This is an answer to a question I get too often: why don’t you like APIs for Open Data? What is not to like about APIs? Today, if you want to be cool, you have an API for third parties to integrate with basically anything. While there is a lot of uncertainty about what an API exactly is, we can agree it is something which third party developers can use in their programming code to do something. APIs exist to talk to your IoT devices, APIs exist to other people’s software routines and libraries, and APIs exist to exchange data between different parties. And truly, I love this idea! The developer wants small fragments of the data which can be retrieved in JSON or XML (I know, you probably want JSON, but hey, also government and enterprise people are reading this blog!) instead of having to download a data dump or scraping HTML pages. The developer is lazy (in most cases this is a good property of a developer) and (s)he wants the data publisher to pay for a free service for their app. For the first point: great you are advocating for open web standards such as JSON! Yet, what you are advocating for now, is a whole new channel, which requires new funding only to set it up: new servers, new consultants programming HTTP interfaces, new ETLs, etc. Because of observation that these APIs often then become a second inferior channel, some thought leaders started preaching “API first!”. This way, they preach their website itself should use this API to show the data. The core idea is good: document all your resources and work on a decent http URI-strategy. However, why do you still need a separate API? Your HTML pages are also resources part of this http URI-strategy, so you could as well just return JSON on a page using the http Accept header, or annotate your HTML pages with machine readable snippets. you cannot ask combined full text search queries over different governmental websites: you can only ask the servers separately, but integrating both result sets will be troublesome. So, if you want to use data from the government in your production apps or your next start-up, you will want data access which allows you to replicate the entire dataset on your own machines. That is why we need the government to publish their data licensed under e.g., a CC0 license. A data dump is certainly data publishing, yet there are many drawbacks to publishing a data dump: when publishing data that changes often, having to update this data dump on your server every, let’s say second, is a bit much. That’s why I think a more Web-ish approach would not hurt: small documents (JSON, HTML, whatever) that link together a big Web of knowledge. An interesting way of working towards that is having a resource oriented approach, where you first identify all the resources you have in your dataset using a global identifier (such as a URI). Then, you create documents of data (identified by e.g., a URL) which contain something about these resources. The documents can be structured just like you would structure your website, and links direct you from one document to the other. This way, programmers can write source code that follows links (the idea of hypermedia!) to answer more difficult questions that those answered in only one document. And for the documents themself, they are small enough to contain rapidly changing data. The Europeana API: well documented by Ruben Verborgh in his blogpost The Lie of the API. Check out schema.org! It is a way to annotate your HTML-pages with rich snippets. This way, the scraping of the website to generate a data dump goes easier, and the entire Web becomes more structured as websites are annotated with similar properties. Check out Linked Data Fragments. It is a way to publish your data in fragments which makes clients, when asking multiple small questions to download parts of the dataset just in time, still able to ask very complicated questions. This is the true power of the Web: combining resources to solve difficult questions. Check out Linked Connections: it is Linked Data Fragments applied to route planning. Huh? So what are you doing with api.iRail.be? Is that not a good example? Indeed: it is not a good example of how to publish Open Data. We also never said it is the goal of api.iRail.be to publish the data: after all, we are not the data owner. We have created a service, available for free for everyone, which enables everyone to do calculate routes on the Belgian railway network and display this in various apps, such as Railer and BeTrains. We do this as a non-profit project that wants to make our transport experience in Belgium better. For the data dumps itself, head to gtfs.irail.be. In the same logic, I applaud any initiative of open data reusers offering free services to hobby developers, but you will hear me complain when a data publisher is spending its time on this instead of raising their own data quality. This entry was posted in open data on April 22, 2016 by pietercolpaert. This entry was posted in iRail, NMBS, open data on April 21, 2016 by pietercolpaert. This entry was posted in NMBS, open data on April 14, 2016 by pietercolpaert. This entry was posted in NMBS, open data on January 13, 2016 by pietercolpaert. This is a guest blog post by Pepijn Mores, a student at HELMo Saint-Marie. 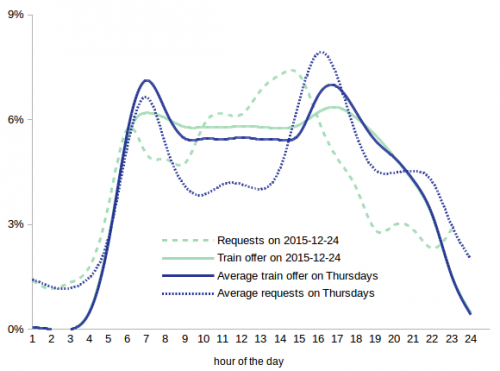 In this blog post he shows how easy it is to create an app to fulfill his own transportation needs, which we thought is very interesting: it is not always the big companies that use the data from the SNCB. Would you like to write a blog post here yourself? Contact us! For the final project of my C# course at HELMo Saint-Marie, I had the opportunity to choose my very own topic. Only two requirements needed to be met: it had to be developed in C# (obviously) and it had to involve a technology we didn’t study in class. The amount of possibilities was enormous , therefore I decided to search for a subject that would actually be helpful to me in some way. 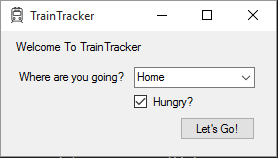 Because I return home every weekend and the train takes about 1,5h, I came up with the idea to make an application for my PC that would look up the train tables and check if I had enough time for a sandwich at Panos at one of the changes. It was the perfect solution for me to look up the trains when I was attending my last course on Friday afternoon, so that I could plan my trip home whilst sitting in class. So that’s where the API of iRail came in. I studied the structure of the XML file the API returned and noticed the large amount of information it contained. I expected it to be just a list of stations with arrival and departure times, but instead I was surprised by information like the exact coordinates of the train stations and the code of the vehicle. I was stunned by the potential this data had. But because I had to meet a tight deadline and exams were coming up, I decided to stick to my original idea. The transformation of the data of the XML into my own defined models was done using the Language Integrated Query (LINQ) feature in Visual Studio. After the transformation, the user can view the data in Windows Forms and access the connections details (with the note if there is time for a little snack). I designed 3 simple views: one setup view, one view with a list of all connections and one detailed view. The setup view just takes the basic details needed to perform the request, the list view gives the user an overview over the coming connections and the detail view gives the user the exact hour and platform of departure/arrival. The main thing I learned by developing this little application is not how much fun it is to work with LINQ or C#, nor did I learn to design a beautiful user interface (I am sorry if the bright red hurts your eyes). But I did learn that data on (public) transportation should be widely available and implemented in projects. Thanks to iRail, I recognised the opportunities and challenges that are present on public transport and open data in Belgium. Data on public transport carries a huge potential and inspired me to work on another train-related subject in the future (GTFS, yes I am looking at you). This entry was posted in Uncategorized on January 4, 2016 by pietercolpaert. Today, the Belgian railway company announces a data sharing program for third party developers. They will start sharing the planned schedules (“static data”). We are cautiously excited that this is the first step towards a real open data policy. You can request your own 1-on-1 contract via http://www.belgianrail.be/nl/klantendienst/infodiensten-reistools/public-data.aspx. We hope to make our own version, linked to our identifiers, available through http://gtfs.irail.be soon! What does this mean for the end-users? Companies like Google, Nokia, Microsoft and others can now start reusing the data if they negotiate a one on one contract. Starting today, you will see route planners from third parties work with NMBS/SNCB! Android and Google Maps users will be very excited as they now will also see trains suggested to their destination instead of only buses when selecting public transit. Why isn’t this open data yet? Open Data means that there’s no discrimination in who can reuse that data and that there’s no restrictions in in what way it can be used and redistributed. For now, you can access the data after signing a 1 on 1 contract. We think it’s a good thing NMBS/SNCB is testing the water before the law that will oblige NMBS/SNCB to do real open data comes into action in 2016. We look forward working together and iRail is as well in the process of requesting a license. We however want to be able to republish the data once we added our data to the dataset, which now isn’t allowed by default. Why is iRail (cautiously) happy? We once were forced to stop building applications using the data of NMBS. The original posts from 2010 can still be found in our archives. Today, the first steps towards Open Data have been taken and we are sure they will not regret it. We will slowly migrate our servers to make use of this official dataset. We look forward to seeing you build awesome new things with this high quality data! This entry was posted in iRail, News & events, NMBS, open data, Politics on September 22, 2015 by pietercolpaert. Ever since public transit agencies have found their way to the Web, they inform travelers using route planning software made available on their website. These travelers also need to be informed about other modes of transport, for which they have to consult other websites, or for which they have to ask the transit agency’s server maintainer to implement new functionalities. In this demo, we introduce an affordable publishing method for transit data, called Linked Connections, that can be used for intermodal route planning, by allowing user agents to execute the route planning algorithm. We publish paged documents containing a stream of hops between transit stops sorted by departure time. Using these documents, clients are able to perform intermodal route planning in a reasonable time. Furthermore, such clients are fully in charge of the algorithm, and can now also route in different ways by integrating datasets of a user’s choice. When visiting our demo, conference attendees will be able to calculate intermodal routes by querying the Web of data using their phone’s browser, without expensive server infrastructure. This entry was posted in Uncategorized on August 28, 2015 by pietercolpaert. It’s been since April that we haven’t done another community update. Back then, we announced our migration to new servers, we’ve announced that we would have 2 students at open Summer of code 2015 and that we would start building a GTFS ourselves, as the law would now permit us to do so. NMBS/SNCB will open up their data by the end of this year… but why wait if their data is already on their website? Check out http://gtfs.irail.be! 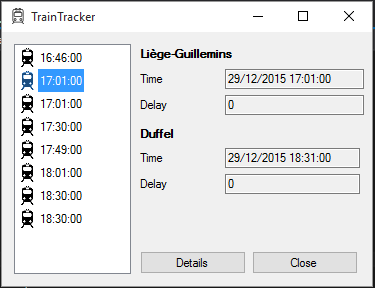 It now contains data from NMBS/SNCB for 2015, including our first realtime feed for the Belgian railway company (huge news for techies)! This feed contains the updates such as train delays and notifications on the entire network. You can discover what’s in this GTFS-RT by checking out our new dashboard http://analytics.irail.be. The project has been developed during open Summer of code 2015 by Brecht Van de Vyvere and Tim Tijssens. A report on their 3 week journey can be read over here: http://open.summerofcode.be/?s=gtfs. Nice GTFS bla bla… but what does it mean for me? If you are not technical, you might be delighted with this news: you can now do intermodal route planning across entire Belgium with apps such as CityMapper and Ally. Furthermore, also webservice creators such as the guys from Navitia.io implemented our feeds in their webservice! As a developer, you can now use their API to get route planning advice from A to B across Europe. I know, this one was also announced in the April updates, but hey… they now added support for the Apple Watch! Version 1.4 has just been submitted to the App Store. Featuring Apple Watch App, location awareness and a lot of other cool new stuff. A new Android app hit the market. Let us know what you think! Moving away from apache, now installing nginx and varnish for cachability. We used to have varnish installed over apache a while back. Then we’ve decided to put HTTPS on all our domains. Now, we’re going to make our servers faster again by installing varnish. This will be done by the lovely people of skyscrapers (who gladly gave me a spot to work when I was in Antwerp last week This entry was posted in News & events, open data, Summer of code on August 11, 2015 by pietercolpaert. When we first read the results of the 2014 Open Data Index, we said we had big expectations for 2015. We couldn’t be more right: today, the federal ministerial council has, by recommendation of Minister De Croo and Secretary of State Francken, approved an ambitious federal open data strategy. Open by default: an important step to embed Belgium into the digital global ecosystem. State owned companies are included: the same strategy applies to e.g., Proximus, bpost or the Belgian railway company SNCB/NMBS. All government services will have to appoint an open data champion, which is the contact point for the datasets within that organisation. Open Knowledge Belgium, the board and its community members, are unanimous: we couldn’t be more excited. The strategy gives us the needed policy guidelines to build further on a more open Belgium. The Public Domain Review is a not-for-profit project and we rely on support from our readers to stay afloat. If you like what we do then please do consider making a donation. We welcome all contributions, big or small – everything helps! This entry was posted in featured, General, open data, Open Government, strategy on July 24, 2015 by pietercolpaert. This entry was posted in Events on June 24, 2015 by pietercolpaert.